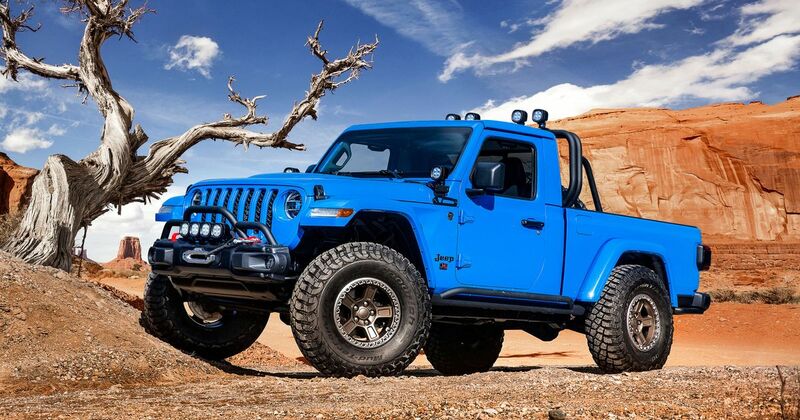 Jeep likes a good concept vehicle. 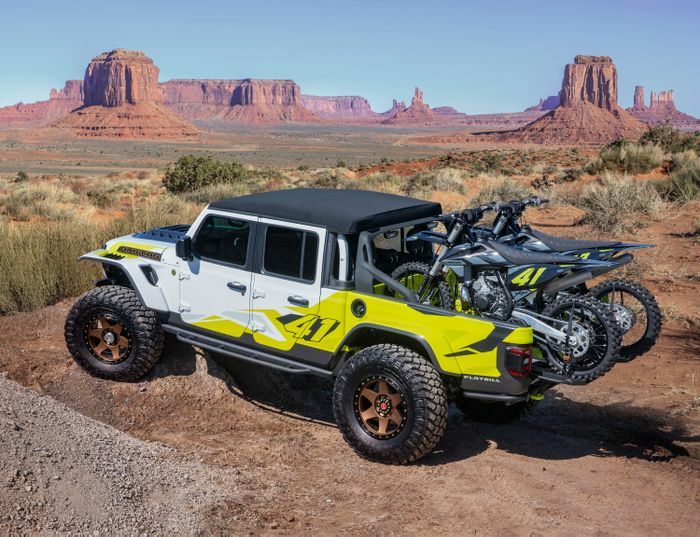 It also likes to go nuts with the official parts catalogues, and for this year’s Easter Jeep Safari in the Moab desert, the Gladiator has spawned six brilliant new ‘concepts’ you really could build yourself. The Wayout concept is designed for going, err, way out into the wilderness. Its most obvious feature is a roof-top two-man tent placed nice and high out of the reach of anything that thinks you’re a midnight snack. There’s a two-inch suspension lift, 37-inch mud tyres, a 12,000lb (5.44-tonne) winch and a snorkel to make wading and mud-plugging easier for the 3.6-litre Pentastar V6 and eight-speed automatic gearbox. The Gator Green body is armoured, but there’s a slight weak spot in the shape of two neatly-integrated fuel tanks in the shape of Jerry cans, placed within the bodywork above and behind the rear wheels. If your dual passions are Jeeps and motocross, you’re in luck with the Gladiator Flatbill. 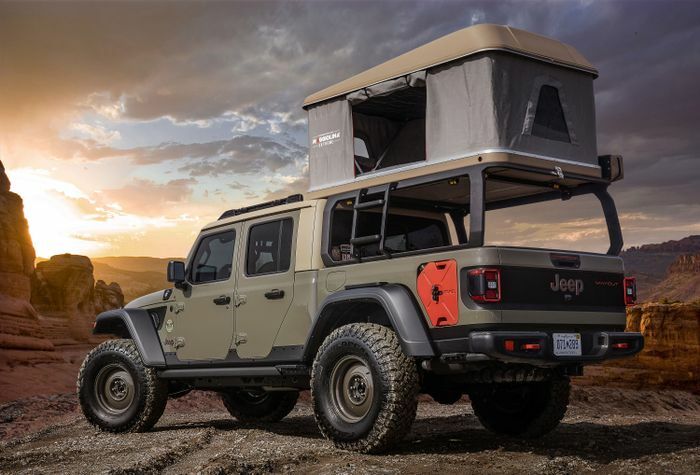 A ‘rowdy’ design clothes what Jeep calls the ‘ultimate hauler for an array of toys.’ It comes equipped to transport two off-road bikes in its load bed, complete with fold-out ramps for loading and unloading. For some reason it has a vented carbon bonnet (or hood, if you insist) with high-clearance wheel arches and specially shortened front bumper/skid plate assembly for an improved approach angle. A tubular rear bumper provides a better departure angle at the back. Combined with a four-inch suspension lift and 40-inch tyres, the Flatbill is a proper go-anywhere animal. Either someone at Jeep is really bad at fractions or the Five-Quarter concept is a nod to Jeep trucks of the past that went by the same name, which was inspired by their 1.25-tonne (five-quarter-tonne) load capacity. Based on a 1968 M-715 but resto-modded with carbonfibre front end bodywork, a six-foot aluminium load bed, xenon headlights, a more modern suspension system, new axles and 40-inch tyres. The seats come from the latest Wrangler but without headrests, while the consoles are trimmed with aluminium components cut by high-pressure water jets. The engine is one of the key highlights, though. Under the carbon skin is a supercharged 6.2-litre ‘Hellcrate’ Hemi V8 with over 700bhp. We think we could live with this. The J6 is all about performance trucking. 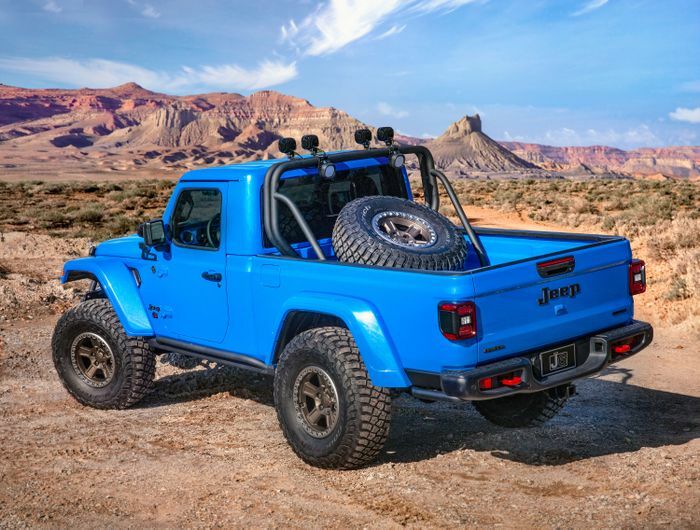 Classic Jeep truck styling meets a swathe of concept and production performance parts to create a two-door utility truck with a 12-inch longer load bed compared to a standard Gladiator. The Metallic Brilliant Blue paint tips its cap to the 1978 Jeep Honcho. The bed is protected by a clever prototype ‘spray-in’ bed liner. Standing over the bed and the 37-inch spare tyre within it is a light bar of four five-inch LED spotlights. There’s a two-inch lift, a two-inch stinger bar and rock rails bolstered by two-inch steel tubes. You can mount extra lights on the stinger bar, and all the auxiliary lights are connected to a dedicated interior switch. You won’t find much unique about the JT Scrambler’s makeup apart from its looks, which are another throwback to Jeep heritage. There are 37-inch tyres with a two-inch suspension lift, an LED light bar with extra, diffused bulbs to illuminate the load bed, and a couple of even brighter forward-facing LED lights on the nose. The Gladiator Gravity is a rock-climber. Exclusively using parts available at the Gladiator’s launch, this V6 Rubicon-spec truck is painted Punk’N Metallic Orange with a layout of crossrails in the load bed that can carry a special cargo carrier basket. 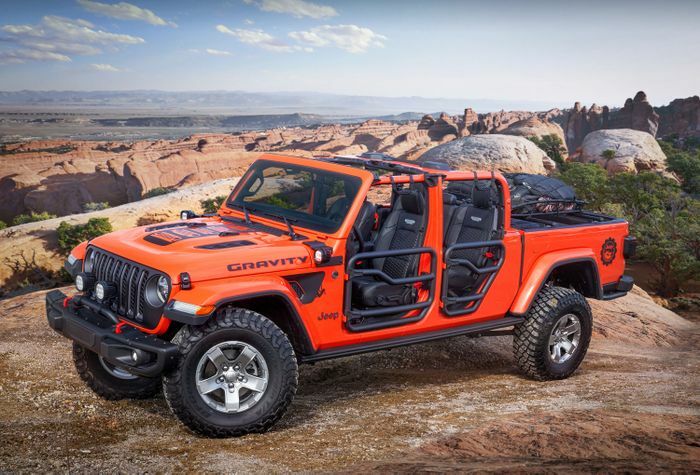 The doors have been swapped for two-inch tubular steel frames, the roof is open and the leather seats, while a bit of an extravagance for a functional Jeep off-roader, feature the Jeep ‘grille’ logo. Handily, there’s a unique ‘plug’ system in the floor to allow for the direct draining of water and mud. Which is your favourite? 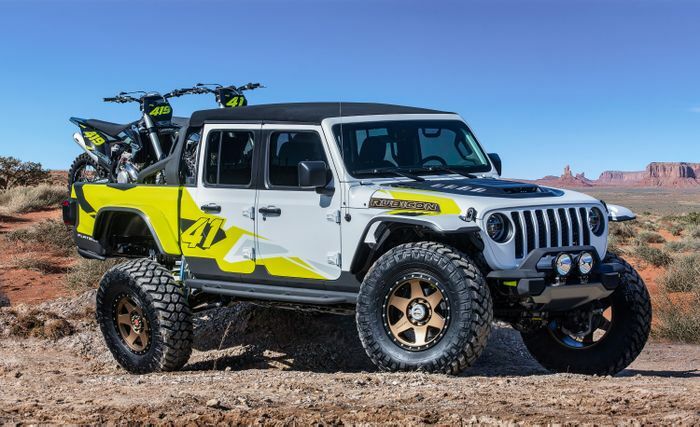 In which one would you want to tackle the Easter Jeep Safari in the Moab desert?